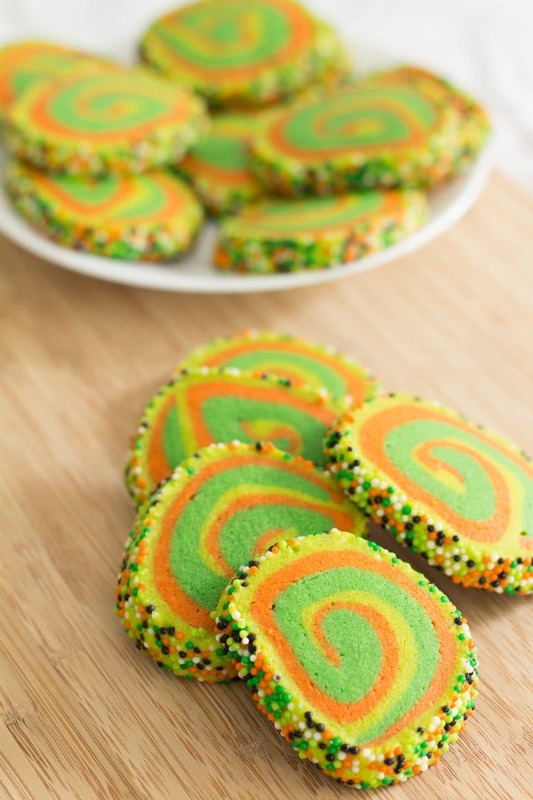 Vanilla Icebox Pinwheel Cookies are a simple sugar cookie that can be stored in the refrigerator, then sliced and baked as needed. 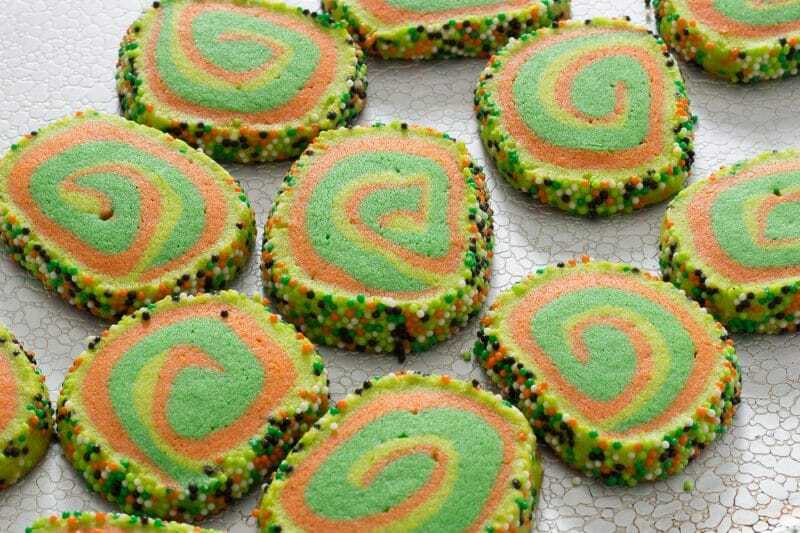 Much like our Sprinkle Cookies, these cookies are easily colored to match the holidays or your mood. Since Halloween is upon us, I made a Halloween version this time. I chose colors that matched the first Halloween cookie sprinkles that I could get my hands on this year. Ghouls’ Night Out is a nonpareil mix that has black, orange, white and two shades of green. 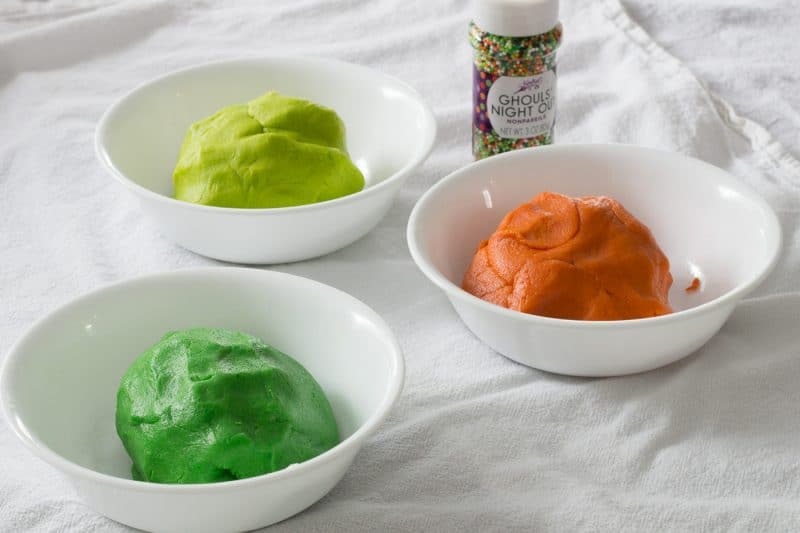 You can color your dough any shade of any color you like. The orange portion of the dough was a combination of no-taste red and lemon yellow icing color. The lightest green color was a mixture of bright yellow gel with just a hint of kelly green. 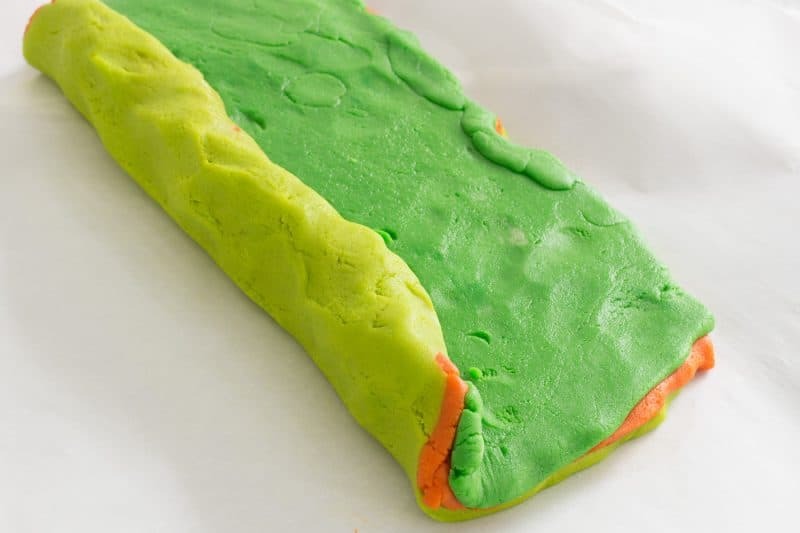 When I say just a hint, literally, I used a toothpick to stir the green gel and then stick the toothpick into the dough and continued mixing. You can make it dark or light as you like. The darker green was just kelly green icing color. It really is the best to use a toothpick for coloring with icing coloring. Icing coloring by Wilton is more concentrated than liquid coloring and a little bit goes a long way. 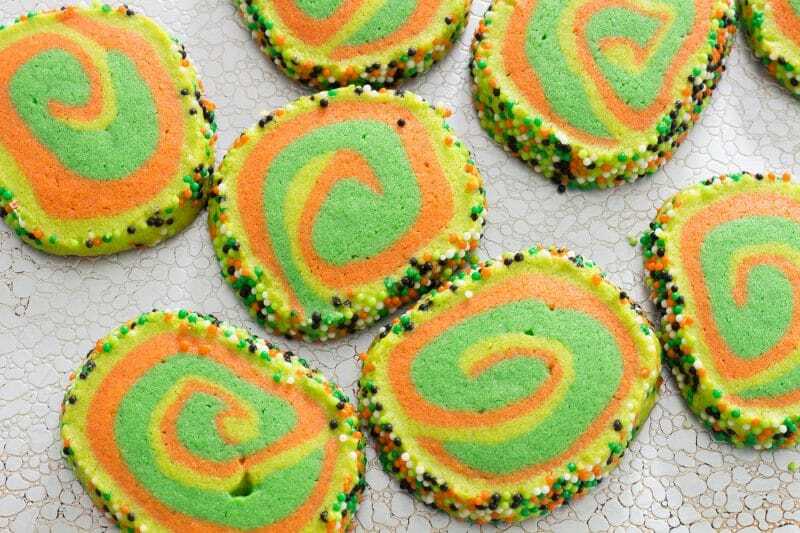 I choose to use light green, dark green, and orange in my swirls to match the sprinkles I had. 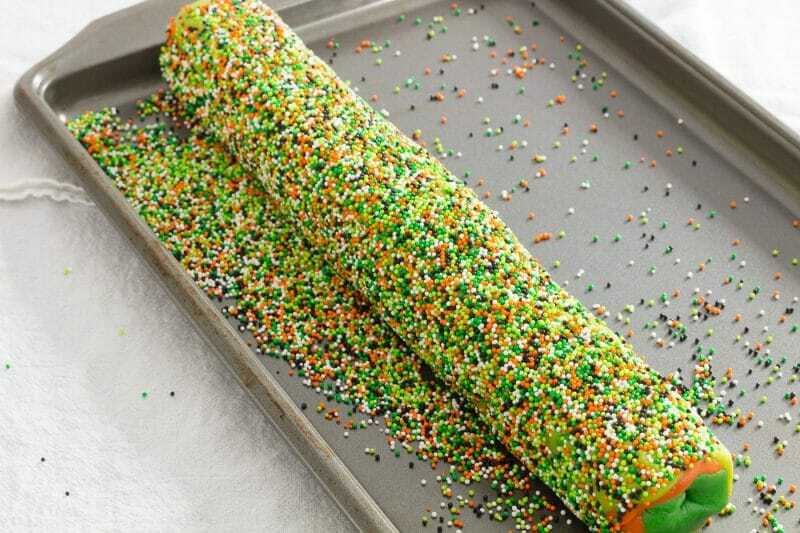 The nonpareil mix I used was the Ghoul’s Night Out sprinkles with black, white, orange, light green, and dark green. I didn’t use black as one of the cookie colors because black tends to have a flavor when you use enough coloring to get something to turn black. Jet black is a difficult color to achieve in baed goods using food coloring anyway. If you are set on getting a jet black color in these cookies, I would suggest using a chocolate shortbread or sugar cookie recipe. Then I would use black cocoa rather than the cocoa you can buy in a grocery store. Black cocoa is where Oreos get their color from. I do not refrigerate my dough before I roll it into a log. 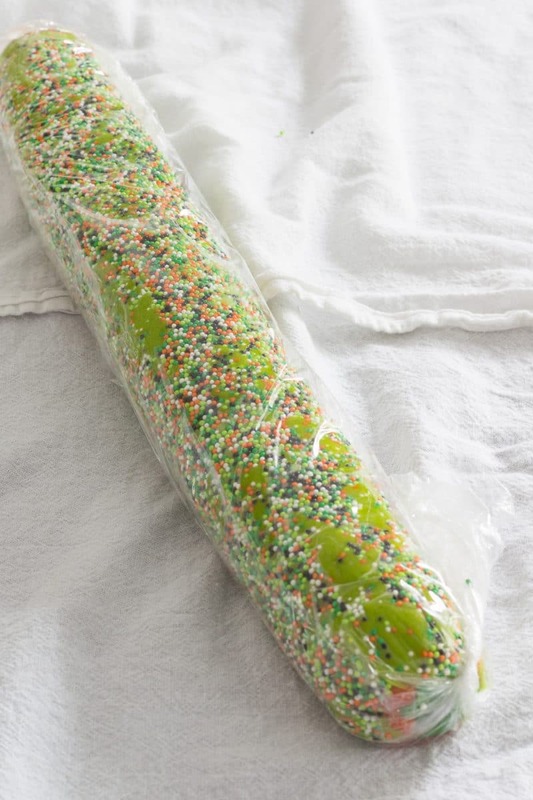 The nonpareils stick better to a warmer pinwheel cookie dough. I find the best way to cover the dough with nonpareils is to dump all of the sprinkles onto a cookie tray with sides. Because my kitchen was so warm, I probably should have given all 3 layers a 5 to 10-minute rest in the refrigerator first. My dough was a touch too warm while I was rolling the cookie dough into a log so it caused some stretching of the outer layer. While it did make thinner layers, the warmed dough did allow me to repair any tears that happened on the outer layer. On the flip-side, the may not have been any tears in the dough had it been cooler. Yes, there were some breaks in the cookie dough as I was rolling it. 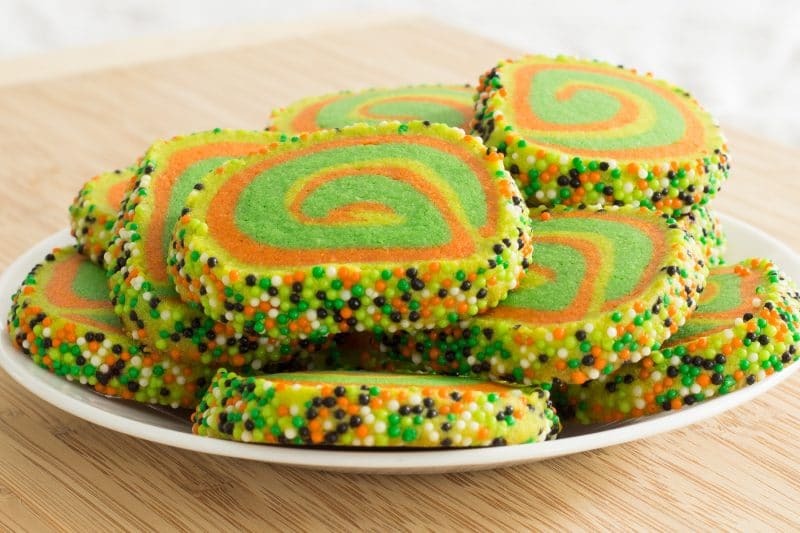 Not only does it cause tears when rolling up the dough, but the pinwheel cookie log also flattens itself under its own weight as it sits in the refrigerator to rest. I’m OK with the shape of these cookies though, they are supposed to be kind of spooky and ghoulish. A few of the shapes and swirl patterns even remind me of something one might find in Dr. Suess books. This dough does need some time in the refrigerator after rolling into a log. Once the log is rolled I stick it onto a piece of plastic wrap and give it a roll on a table or countertop to try and make the log as even as possible. 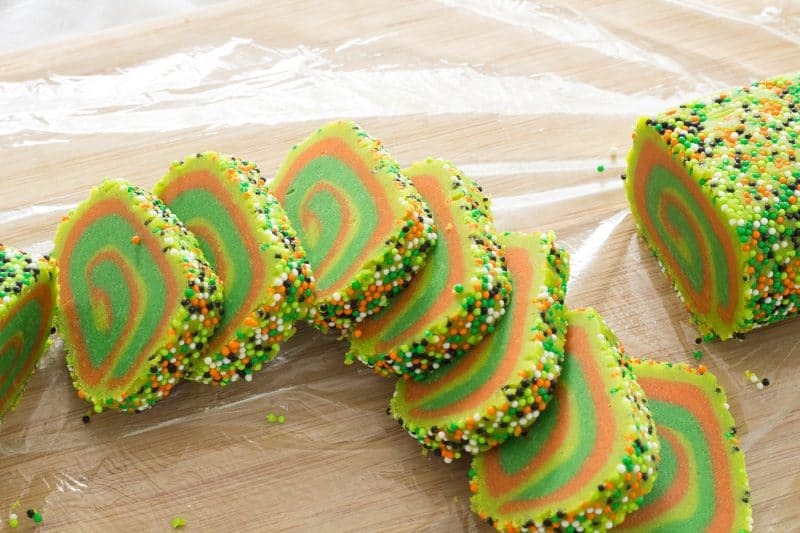 Refrigeration serves to fully hydrate the flour and also provides stability needed to cut these pinwheel cookies into thin slices. All of my slices were between 1/4 and 1/2 of an inch thick. If you find that some of your slices are thicker than the others, go ahead and stick the thicker cookies together on a cookie sheet. The cookies will cook more evenly if all the slices on each cookie sheet are of similar thickness. 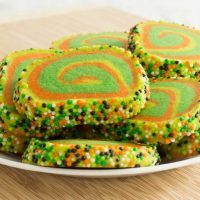 Swirled Vanilla Icebox Cookies are a simple sugar cookie that can be stored in the refrigerator, then sliced and baked as needed and are easily colored to match the holidays or your mood. Combine the butter and sugar in a large bowl and beat until creamed. Add vanilla and egg, mix to combine, scraping the bowl if necessary. Add baking powder and cream of tartar, mix well. 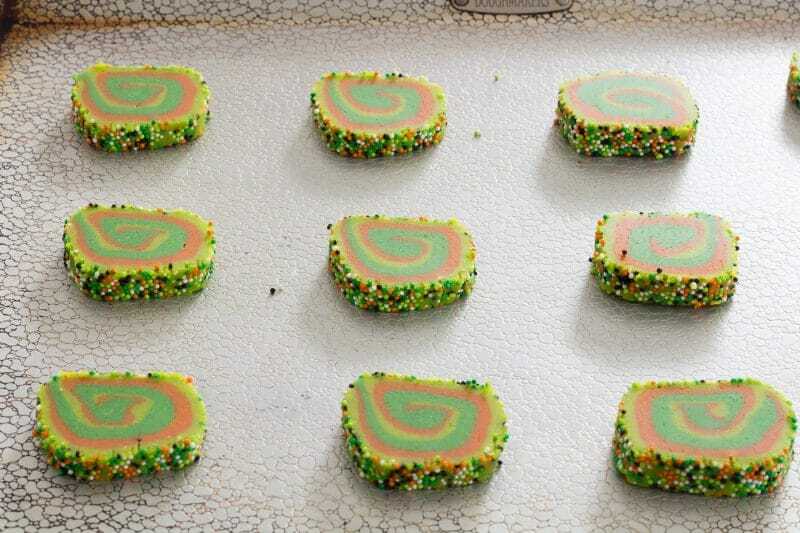 Separate dough into the number of colors you want for swirls. I would not recommend more than 3. Color each portion of dough to the desired color. Make the colors darker than you want as the colors will lighten during baking. Roll each color into an equal size rectangle. Mine are usually about 9-inches wide and 12 to 14 inches long. 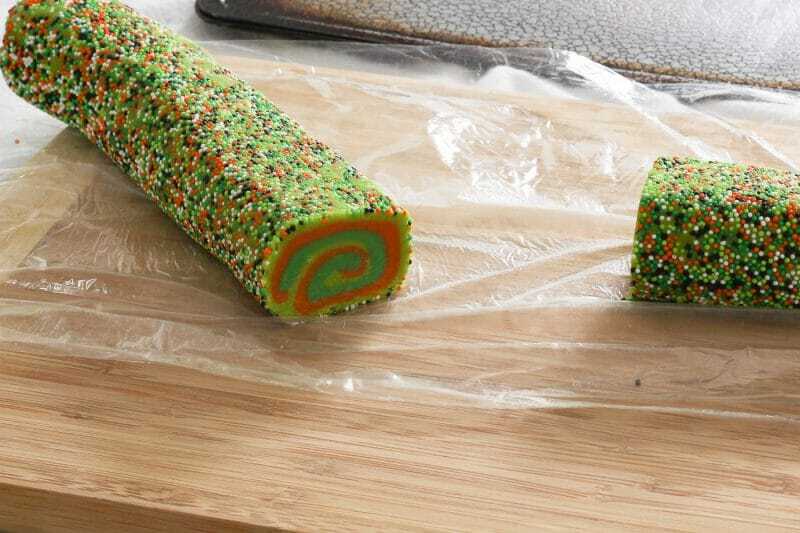 Place the layers on top of each other and lightly roll to press the pieces together. 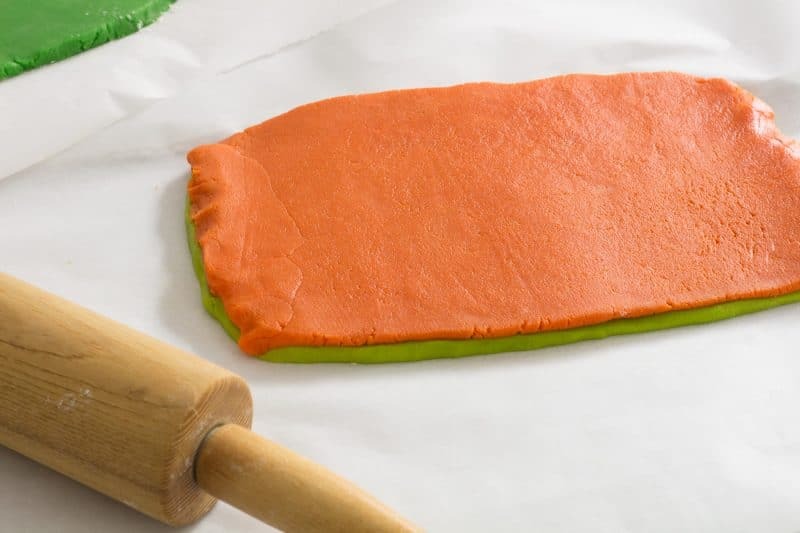 Starting with one of the longest sides, begin rolling dough into a log and patting the ends together so that you don’t lose any cookies. If the dough starts to fall apart, place the layers into the refrigerator for 10 to 15 minutes. 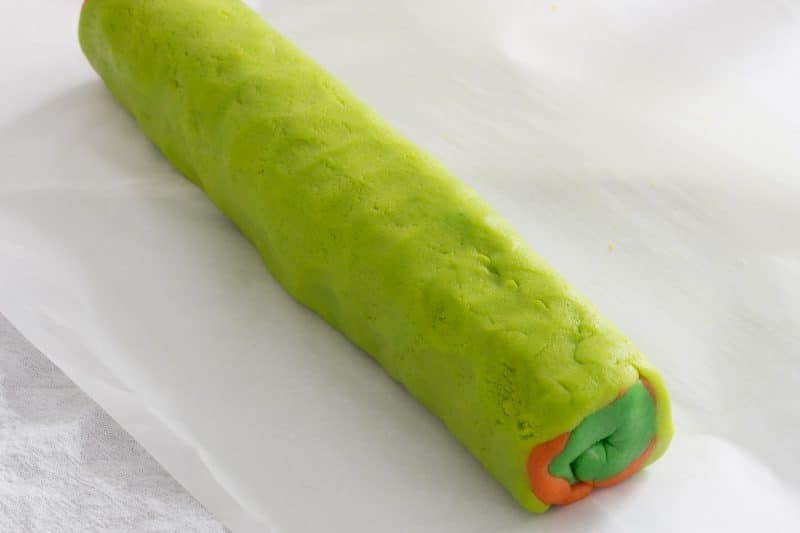 Once the dough is rolled into a log, wrap it firmly in plastic wrap and place into the refrigerator for at least hours and up to overnight. The dough log can also be frozen at this point for later use. Once the dough has been chilled, preheat an oven to 350⁰F. Remove dough from the refrigerator and slice into 1/4 to 1/2-inch slices. Lay cookie slices onto a cookie sheet, leaving at least 1 inch in between cookies. Place cookies into the preheated oven and cook for 8 to 10 minutes or until the bottoms are just turning golden brown. Remove cookies from the oven and allow to cool for 1 minute before removing to a cooling rack to continue cooling.